Some of the French settlers with Champlain stayed on the island for a few months, during which 35 of 79 died of scurvy. The rest later settled in Nova Scotia. Another French settlement on the island was destroyed in an attack by the British in 1613. The island has long been known to locals as Dochet Island. The name "Dochet" has an interesting origin. It's said that a local girl in pioneer times, named Theodosia ("Dosia") Millbury, often would row to the island, hence the name "Dosia" or "Dochet." St. Croix River Light, established in 1857, was listed as the first lighthouse of the First Lighthouse District. The lighthouse was an octagonal wooden tower on top of the keeper's house. The lantern held a fifth-order Fresnel lens. A fog bell tower with striking machinery was also built. 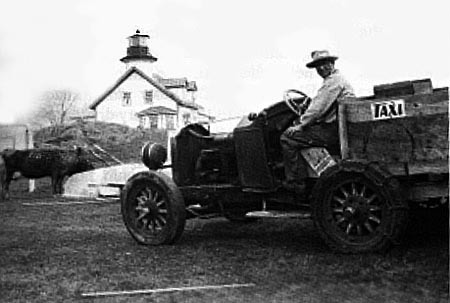 The lighthouse was rebuilt in 1901 in a style very similar to the original structure. The second St. Croix River Light. Courtesy of Connie Small. He told them, that a short time before, in digging up a new piece of ground, he had discovered some bones and skulls; these were probably the remains of De Motte's party, who came to the Western wilderness to die, 'unhonoured and unsung,' though possibly no colonists suffered greater hardships than did these poor people. The station was considered highly desirable by keepers and their families, with a comfortable house and beautiful surroundings. Keeper Elson Small and friend. Courtesy of Connie Small. 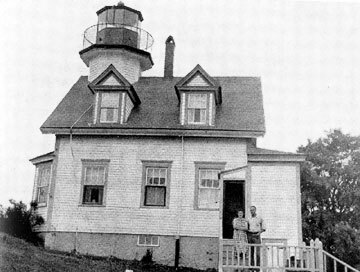 In her book The Lighthouse Keeper's Wife, Connie Small described her life at the light station with her husband, Keeper Elson Small. The Smalls had lived previously on barren Avery Rock and Seguin Island. Mrs. Small called the island, where she and her husband lived from 1930 to 1943, "a little paradise." Visitors were frequent in summer, while winters were a time for Mrs. Small to paint and work on her quilts. 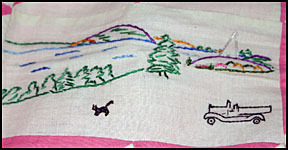 One of her creations showed scenes of life on Saint Croix Island. 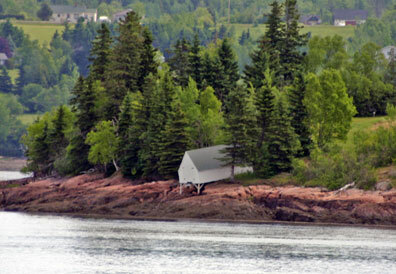 As pleasant as Saint Croix Island was in summer, it could be brutal in winter. One year temperatures stayed at 27 below zero or lower for more than two weeks. Tradition tells us that Saint Croix Island was the first place in North America where Christmas was celebrated. That event was commemorated in December 1941 when, just after Pearl Harbor was attacked, Franklin Roosevelt was entertaining Winston Churchill at the White House for Christmas. An 18-foot tree on St.Croix Island was cut down to be that year's White House Christmas tree. Elson Small in the Dochet Island "taxi." Courtesy of Connie Small. 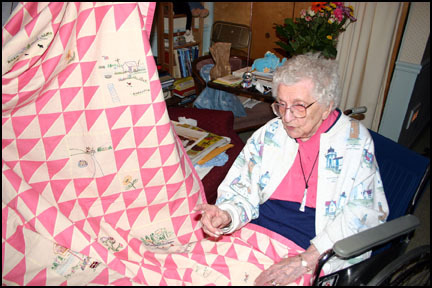 Connie Small (1901-2005) with her St. Croix Island quilt in 2004. The quilt is now on display at the Maine Lighthouse Museum in Rockland. A panel from Connie Small's quilt showing scenes of life at the St. Croix River Light Station. Keeper Elson Small and Connie's brother Gerald built a small windmill to supply electricity on the island. One summer a visitor who arrived in a yacht told Keeper Small that he should patent his highly efficient windmill. The man turned out to be a prominent New York engineer. Small never did patent his windmill and similar windmills soon appeared on the market. The light was automated in 1957 and the keeper was removed, leaving the station abandoned. In 1976, three youngsters landed on the island on a windy day and started a campfire on the floor of the bell tower. The winds whipped the flames until most of the structures on the island were reduced to ashes. Except for an 1885 boathouse, the pretty station on Saint Croix Island exists only in memory now. All that remains from the light station is the boathouse. 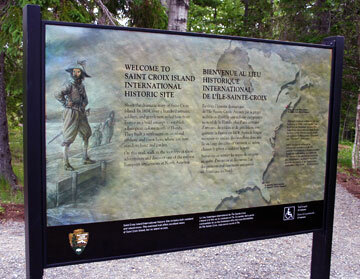 Visitors to the onshore Saint Croix Island International Historic Site can read about the French settlement on a series of interpretive signs. 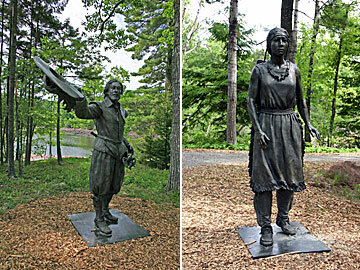 Statues on the site also help tell the story of Saint Croix Island.